I bloody love breakfast, I just really don’t understand when people just skip it? Like, how?! The odd thing is, I’m really not a morning person, I love when I actually get up early but the majority of the time I will convince myself of ANYTHING to stay in bed a little longer. I’m lucky I don’t have a 9-5 job, I would be a horribly disgruntled person to have to deal with in the mornings. Rob is the opposite to me, he could care less about having anything different or special for breakfast, he’s happy with a slice of bread with some smeared on peanut butter and a side of black coffee. I can’t really handle having the same breakfast 2 days in a row, unless I’m in an odd mood. Porridge is a breakfast that makes me happy and reminds me of being a child and having breakfast made for me before school. Seen as we only get a week of Summer in Ireland, you can easily eat it all year round without the seasons affecting you… for me this is great, most normal people would not agree. I have a few porridge recipes to share, my favourites. This first one is a mixture of Oats, Quinoa and Chia seeds. If you just want to use oats that’s no problem but the other grains just add an extra level of texture, which I love when making porridge. The Quinoa takes a little longer to cook so this porridge recipe takes a bit longer than the usual, but I think its worth it. This breakfast is beautifully creamy with that perfect balance of lingering Vanilla. 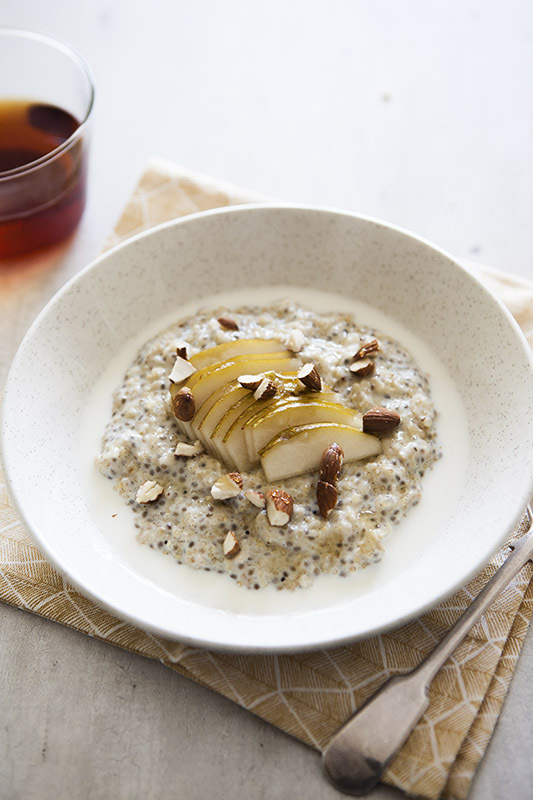 I always have to have added crunch from some nuts and sweetness from some fruit, you can pick any but I think Almonds and Pears go perfect with the creamy vanilla aroma from this porridge. In a medium sized saucepan, add all the grains, honey, vanilla, milk, water and salt. Bring to a boil, cover and reduce the heat to a low/medium, and frequently stir. After about 12/15mins check if the Quinoa is cooked and the porridge has thickened. Pour into bowls and top with the sliced pear, almonds and a little more milk. Porridge is always best eaten straight away. I like to eat this porridge with a brew of rooibos tea. So cosy! Try it with chia that has been ground to a coarse powder. It’s better.